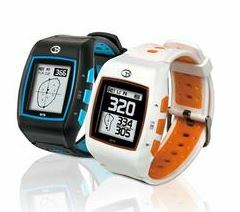 La Palma, CA – GolfBuddy, a global leader in the golf GPS industry, has just launched the WT5 – a feature-rich golf GPS watch that complements GolfBuddy’s impressive product assortment of wearable GPS devices. The cutting-edge device offers precise distance measurements while on the course and can also be worn as a watch off the course. An update to the dynamic WT3, the WT5 boasts a slimmer design and a more comfortable fit to your wrist. The watch received a great deal of attention from retailers and customers since it was first revealed at the 2015 PGA Show in January. Available in stores and online mid-April, the stylish yet practical GPS wristwatch will take your golf game to the next level with a functional design and accurate distance measurement. Color options for the WT5 include white/orange and black/blue. The WT5 is rugged, waterproof and durable enough to withstand a rainy day on the course. The WT5 also features all of GolfBuddy’s renowned technology, including: Dynamic Green View, pin placement feature, and also includes up to 8 targets and hazards information. The updated GPS watch provides 8 hours of battery life in full GPS mode and 35 days in watch mode, which includes digital watch mode that displays time, date, and stopwatch functions. The WT5 is complete with more than 37,000+ pre-loaded verified golf courses worldwide, offering superior accuracy. Featuring GolfBuddy’s Automatic Course & Hole Recognition technology, the WT5 device always knows exactly what course and hole you’re playing on. The Digital Scorecard feature can be used on any of the 37,000+ pre-loaded courses and contains a storage memory of 40,000 courses. Like all GolfBuddy products, the WT5 is 100% fee-free with no annual subscriptions or course download charges to pay after purchase. The GolfBuddy WT5 has an MSRP of $249.99. GolfBuddy is based in La Palma, Ca, with product development and course data management centers in Korea, one of the world’s leading suppliers of high-quality electronic products. GolfBuddy has the most accurate course database with physically verified courses across the world.